VRay Dirt is a texture map that can be used to render ambient occlusion. This pass is useful particularly in postproduction for example for 3D architectural renderings to add contrast to the image by darkening corners or areas between close by objects. In this tutorial the Vray Dirt texture is rendered as a render element. To do so, in “Render Settings” go in the “Render Elments” tab and double click on “Extra Tex” to add this element to your render. Select this new pass you created and in the attributes editor open the “Extra Attributes” tab. What happens here is that anything you connect to the “Vray Texture Extratex” input will be used as a complete scene override, in this case we want to connect a “VRay Dirt” node. In this free and interactive tutorial created by the Swiss based 3D Generalist freelancer Joel Stutz, all Vray Dirt attributes are explained with a dynamic range slider. Vray dirt “Occluded color” is the color rendered in occlusion areas. The simulation goes from default black to various different colors. It might add some realism by using a slightly dirt looking color like brown. “Unoccluded color” is the color rendered where occlusion rays don’t reach. By default it’s set to white but can also be tinted, or even given the environment color of the sky for example, if you check the “Environment Occlusion” option box. “Radius” is the distance that occlusion rays travel to determine whether or not a shaded point is an occluded area or not. If the ray dies off before it reaches a shaded point, then the latter is considered to be an unoccluded area. “Distribution” controls how much occlusion rays are narrowed closer to the surface Normal. In the simulation you can observe how by increasing this value the occlusion on the ground seems to gain the shape of the car, as if it was casted straight down from it. “Falloff” determines how fast occlusion transits from “Occluded” to “Unoccluded”. Vray Dirt “subdivs” are the number of samples used to render occlusion. It is recommended to use multipliers of 2, such as 8, 16, 32, etc. The wider the occlusion is spread, the more it renders noisy and therefore more samples are required. “Bias X” pushes the occlusion effect along the X axis, this value can be positive or negative. “Bias Y” pushes the occlusion effect along the Y axis, this value can be positive or negative. This parameter can be used to simulate the effect of dirt being more visible in a downward direction, like dirt dripping down from walls or objects. “Bias Z” pushes the occlusion effect along the Z axis, this value can be positive or negative. “Consider Same Object Only” renders an occlusion ray only if the object that receives it is also the very same that casts it. In this case the tires are one of the few elements visible because within their gaps, rays are both casted and received from the same object. “Double Sided” renders occlusion on both sides of polygon surfaces. By default occlusion is only calculated on the side of the Normals. In this case you can see how by turning this attribute On we also gain occlusion on the opposite side of the leaves’ polygon planes. “Invert Normal” calculates occlusion towards the opposite side of Normals’ direction. “Work With Transparency” does NOT, how the name implies, render occlusion through transparent objects like in this example the car’s windows, but takes the “opacity” attribute of a shader into account. You can see in fact how by turning this attribute On, the car’s interior doesn’t become visible, but the leafs polygon planes, which have a texture map connected to the “Opacity Map”, don’t cast occlusion rays from their entire polygons anymore but only from opaque leafs. “Ignore Self Occlusion” is pretty much the opposite of “Consider Same Object Only”. In fact, polygons are not allowed to cast occlusion on themselves. In this simulation, by turning this attribute On , the tires gaps become brighter because they no longer self-occlude. “Environment Occlusion” gives you the option to tint the “Unoccluded color” with the environment color. In this simulation the car is rendered with V-Ray Sun and Sky. “Occlusion Mode” lets you choose whether occlusion rays are casted uniformly (Ambient Occlusion) or based on the viewer’s angle (Reflection Occlusion). The difference between Phong, Blinn, and Ward is unnoticeable with a “Glossiness” value of 1 so in this simulation a value of 0.7 was used. Notice how “Phong” creates the sharpest occlusion while “Ward” more diffusely. 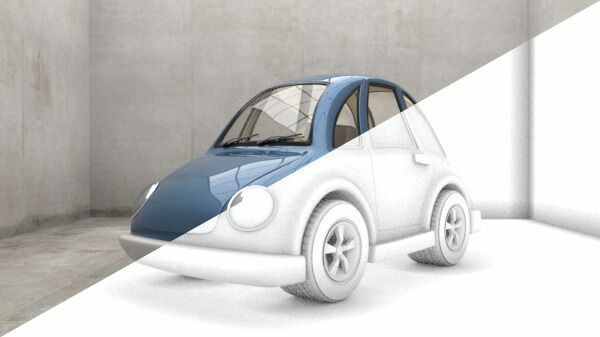 See the VRay Mtl tutorial to understand better the difference between these reflection models. VRay Dirt “Glossiness” controls the blurriness of occlusion reflections. This attribute is only available with a reflective “Occlusion Mode”. VRay Dirt “Result Affect” lets you choose which objects are allowed to cast occlusion rays, in this case only the front wheel. First of all, the way how to connect objects to “Result Affect” is by first selecting them, then going to Crate> V-Ray> Object properties > Apply single object properties node to selection. What happens is that in both the Outliner and Hypershade a new node representing the selected objects is created; you can drag and drop this new node into the “Result Affect” attribute. Be careful not to misunderstand the purpose of this attribute by thinking that it is used to “isolate” an object for occlusion. “Result Affect” let’s you choose which objects are allowed to cast occlusion rays, in this case only the wheel’s polygons, in fact, notice how the wheel occludes the ground but the ground does not occlude the wheel. Also, between the tire’s gaps, occlusion rays are both emitted and received; the only rule is that foreign objects are not allowed to cast occlusion. On the other hand, if you wish to “isolate” an object for occlusion, see the “Exclude As Inclusive Set” attribute. Result Affect “As Inclusive Set” is by default On and basically computes the calculations described in the “Result Affect” attribute. When you turn this attribute Off you are basically reversing the effect, hence you are no longer saying that only the selection (the car’s front wheel) is allowed to cast occlusion rays but that it is the only selection not allowed to do so. In fact you can see how this front wheel is the only one not casting shadow on the ground. VRay Dirt “Exclude” lets you choose which objects to exclude from all occlusion calculations, both casting and receiving rays. In this simulation the front car’s wheel is connected to the “Exclude” input. Exclude “As Inclusive Set” is by default Off and basically computes the calculations described in the “Exclude” attribute. By turning this attribute On you reverse the effect and the car’s front wheel is no longer the selection to exclude from all occlusion calculations but the only one both casting and receiving occlusion. This parameter can be used to isolate occlusion objects.